Click on picture above for pattern! While love is certainly in the air, Valentine’s Day is not the only reason to whip up something sweet and special like this Heart to Heart Granny Square! There are just so many uses, as we have all seen in our pattern hunting endeavors, for a granny square; blankets, hot pads, coasters, even slippers! and that is only the beginning! Everyday we are seeing something new and exciting being creating with a granny square. Who’da thunk?! It is no secret, if you have been around YarnWars lately, that I have been having a bit of fun with the puff stitch in one form or another. Sometimes we get stuck in a loop when we find something we can have fun with and get creative with. I am so happy I took a little extra time with it for this super quick and easy workup. The wonderful thing about this square is, of course, it’s versatility, but also the fact that you can work this up with any hook size or yarn weight… you end up with a charming little creation every time! Give it a go, I would love to see your finished squares! Come and join us over at the YarnWars Facebook group to show off your work. 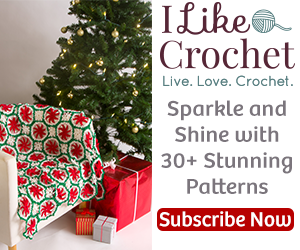 You will be joining thousands of active, supportive, creative yarn crafters from around the world.. just like you! Simply click here for the written pattern here at YarnWars, OR, if you prefer a downloadable / printable copy, head over to our group where you will find all of YarnWars patterns in pdf form in the groups Files tab. Thank you so much for your interest in this new pattern, my friends… Stay tuned for so much more to come!